Showcase your farmers' market finds with a glorious veggie pizza topped with zucchini and peppers. Toss vegetables with 1/4 cup dressing; spread onto rimmed baking sheet. Bake 30 min., stirring after 15 min. 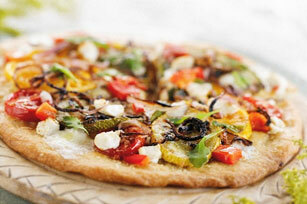 Spread pizza crust with remaining dressing; top with roasted vegetables. Place crust directly on middle oven rack. Bake 10 min. or until edge of crust is golden brown. Top with arugula and cheese. For a refreshing ending, serve with 1 cup of your favourite fresh fruit, such as mixed berries or cantaloupe chunks. Buy zucchini that are firm with bright-coloured, blemish-free skin. Store in a plastic bag in the refrigerator for up to 5 days.